"Before that there had been wild enough stories - accounts of mysterious trips to Thibet, the African interior, the Arabian desert, the Amazon Valley, Alaska, and certain little-known islands of the South Pacific..."
- HP Lovecraft. "The horror in the museum"
You are about to depart on ten journeys into the unknown, following the trail of Cthulhu to isolated Pacific islands, into the icy wastes of the Arctic, through jungles and war zones and even off the Earth itself. In the blank spaces of the map, dark deities flourish and evil festers... But the truth waits to be discovered, secret knowledge that man may not be meant to know but that Miskatonic University covets. Into that mystery tour Investigators go, armed with gun and camera and notebook, risking their own survival to keep those blank spaces from swallowing up the world. Mythos Expeditions collects ten stand-alone scenarios using the new GUMSHOE Expeditions Rules, in which the story looms larger than the book-keeping. 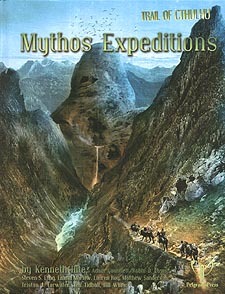 Each adventure can also connect to the Armitage Inquiry campaign setting, expanded by Kenneth Hite in this book as well. Hack through the dense jungles of central Africa, trek across the arid wastes of the Gobi desert, and clamber among the lost cities of Central America. Your searches after strange horror take you through the skies and across the oceans, into the lava caves of New Zealand and the glacial heart of Greenland. The notes and journals, the sketches and hints, that the survivors bring back become Mythos tomes of their own, to drive new Investigators mad - and to drive them onward into the unknown. Hurry on board - the gangplank is going up!